Looking for a super kid-friendly appetizer that’s easy to make, only requires a few easy to find ingredients, and requires no measuring? 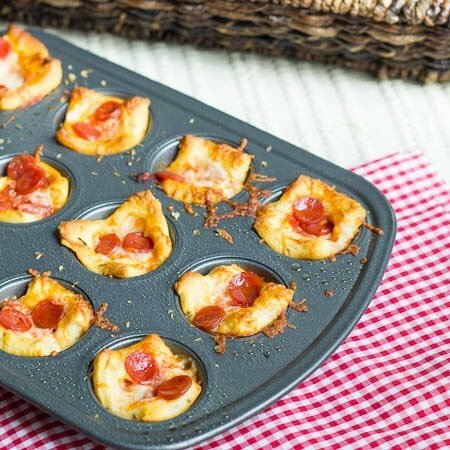 These little Pepperoni Pizza Poppers fit the bill. 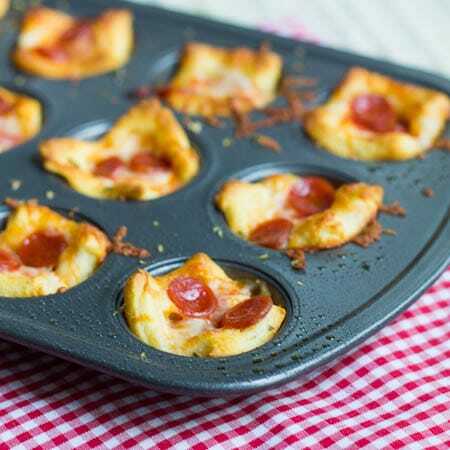 Start with a package of crescent rolls, cut them into small squares, mold into a mini muffin pan, dollop with a little cream cheese and pizza sauce, sprinkle with a touch of oregano, mozzarella cheese, and mini pepperonis, and pop in the oven. Ten minutes later, you have warm and buttery little bites of pizza goodness. I made these recently along with a mess of pasta when my son had his tennis team over for dinner after practice. Cooking for 10 hungry teenagers is no easy task. After they ate, there was still some pasta left, but nary a pizza popper to be found. I should have stashed away a few for myself. Spray a mini muffin pan with cooking spray and preheat oven to 375 degrees. Unroll crescent dough and separate into squares of 2 triangles stuck together. Take each square and press on the seam to seal it. Cut into 4 smaller squares. Between the 2 containers of crescent dough, you should get 32 pieces of dough (if I’ve done the math right). It’s ok if they’re a little misshapen. Press dough squares down into mini muffin cups, shaping them to fit the bottom and up the sides. Using 2 spoons, place a small amount of cream cheese (maybe 1/2 teaspoon, but totally up to personal preference) into bottom of each dough-filled muffin cup. On top of cream cheese, spoon a little pizza sauce (maybe 1 teaspoon) into each cup. Top pizza sauce with a little sprinkling of oregano and mozzarella cheese. 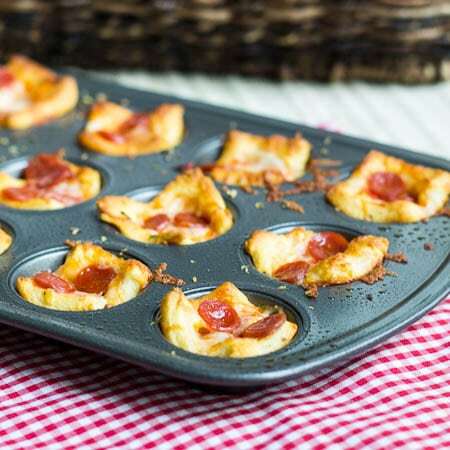 Place 3 to 4 mini pepperonis on top of each popper. Place in oven for 10 to 12 minutes, but check after 8 minutes because you definitely do not want to burn these guys. Let cool in pan for a minute or two, just until cool enough to handle. If reusing the pan for another batch it is best to let the pan cool before placing dough into it. This entry was posted in Appetizers and tagged Appetizer, finger food, kid friendly foods, Pizza. Bookmark the permalink. oh my goodness. I love pizza!!! And these pizza poppers look seriously perfect. yum!! Thanks Aimee! You can’t go wrong with anything modeled after pizza can you?